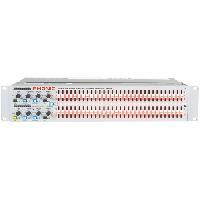 The iA231F is a multi-functional two-channel graphic equalizer with 1/3 octave 31-band ISO frequencies. It features an on-board feedback detection system that can be placed in active or bypass mode. When active it seeks out feedback and helps to destroy it by illuminating an LED on the frequency band slider when feedback is detected. The LED stays lit until the feedback has been eliminated; giving you the vital information you need to level feedback in your system. The frequency band boost/cut range can be set at 6 or 12 dB. This allows for greater refinement of the bands at 6 dB, or more boost and cut at 12 dB. A stereo link function lets you combine the left and right channels and assign the same settings to both of them with one row of frequency bands. Variable low and high cut 18 dB/octave Butterworth filters let you roll off unwanted frequencies, and a limiter is selectable down to -20 dB. Other features include two sub outputs with individual variable crossover frequencies, EQ bypass mode and an 8-segment level meter that allows you to monitor input or output. Connection is through balanced 1/4" TRS phone or XLR-type input and output connectors with selectable operating levels at +4 and -10 dB. The built-in switching power supply means that this EQ is ready to travel and will work almost anywhere in the world. 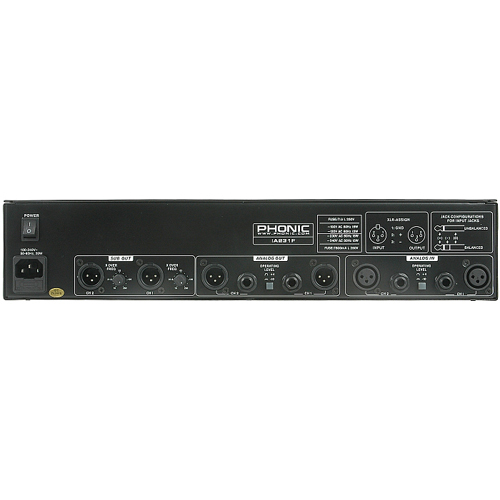 iA231F digital models include AES and S/PDIF input and output with sampling rates that can be set at 44.1, 48 or 96 KHz. Цифров еквалайзер Phonic iA231F 558.33 BGL без ДДС бр.